I absolutely love your colors and the paper! I am waiting on my Sending Smiles set. Beautiful card. The colors on your card just makes me smile!! I am with you, and I feel guilty, I am already tired of winter!! I love the flowers and the set of stamps Sending Smiles holds true to the sets name. I loved your Monday card also and the set of stamps Writers Block is totally awesome. 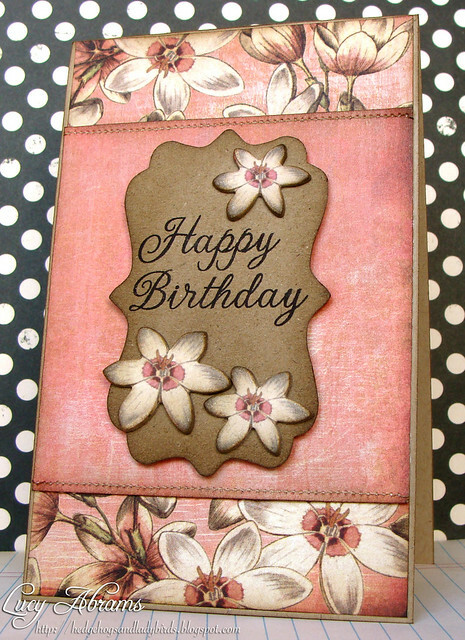 Oh gosh I love this card.So simple yet elegant and of course it's pink! I love cutting out flowers like you did too...wonderful! BTW I just added you to my blog of fav sites. I miss summer too, Lucy! SOOO MUCH! Love this gorgeous card! That paper is stunning! GORGEOUS card, just loving the Curio pp. Lovely card (I liked yesterday's too!) I also love the journaling tag shape. Very pretty card love the colors, it's all beautiful. this one is just so pretty Lucy. That flower PP is wonderful. STUNNING!!!!!!! I just absolutely adore this card, those pinks are divine and I adore what you are challenging yourself, great inspiration.